Hello, and welcome back to our blog! At Salvatore Dental, we have one mission; making sure that all of our patients and Saratoga neighbors know exactly what it takes to make sure that their mouths are as healthy as possible. While it is important to make sure that a proper oral hygiene regimen is followed, as this routine is the main way to make sure that plaque and bacteria remain under control, your teeth require more than a little toothpaste in order to function properly. 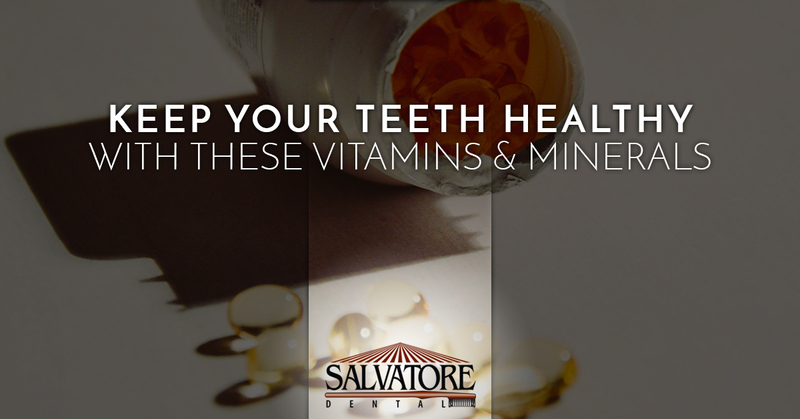 In the first of a two-part blog series, we are going to go over some of the vitamins and minerals that are essential in making sure that a person’s teeth are as healthy as possible. Keep reading to learn more. Like any other area of the body, teeth need certain nutrients in order to be healthy. Without these nutrients, a person may find that their teeth are brittle, their enamel is not in the best shape that it could be, or that there is discoloration that just won’t go away. To avoid these outcomes, we have listed a few of the essential vitamins and minerals that individual need to consume in order to have the healthiest teeth possible. Calcium: At the top of our list is that ever important mineral, calcium. It is pretty well known by the general public that calcium is an important aspect of healthy teeth so, for the most part, we feel like most people take the time to make sure that they take in enough of this mineral. In addition to helping make teeth strong and healthy, calcium is essential in making sure that the jawbone remains strong and does not fracture under pressure. If you’re looking to up your calcium intake, be sure to drink milk and eat foods rich in calcium such as cheese, broccoli, salmon, and yogurt. Potassium: Potassium is good for more than just warding off cramps, it also serves an important function in the mouth by improving bone mineral density. In addition to this function, potassium binds works in conjunction with magnesium to prevent blood from becoming overly acidic, which can work to leach calcium from the bones and teeth. Vitamin K: When you think of this vitamin, think of it like a protective forcefield. Vitamin K works to protect your teeth by blocking substances that break down bones. This vitamin also helps the body produce osteocalcin, a protein that works to increase the strength of bones. Join us again next time as we continue to go over some of the vitamins and minerals that are essential to healthy teeth and gums. Additionally, if you would like to learn more about the dental services that we provide at our Saratoga office, please do not hesitate to get in touch with us at (518)-294-4006 or by filling out our contact form here. We have been helping patients with their oral health needs for years and we are certain that we can help you make sure that your mouth is as healthy as possible.